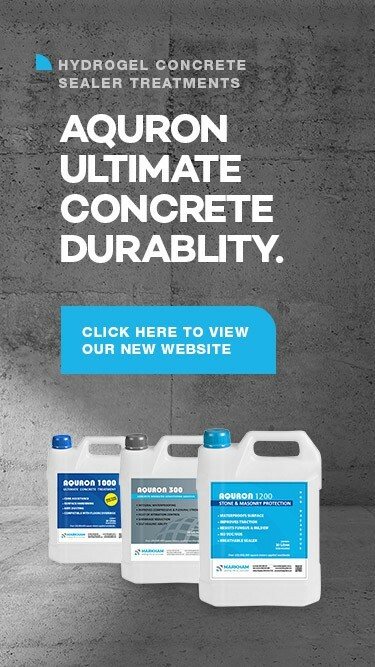 Corrosion Protection and Durability Enhancement for concrete structures. AQURON A7000 Concrete Protection and Chloride Reduction System for concrete is guaranteed to eliminate the action of soluble chlorides in concrete and inhibit corrosion of imbedded reinforcing steel. Economical and excellent performance on concretes washed by seawater and coastal spray, or that have been attacked by salts, acids, effluents, corrosive gases, etc. Contaminants are neutralised or purged from concrete which is protected from further attack. AQURON 7000 Concrete Corrosion Protection also helps eliminate and overcome risks of ALKALI REACTIVITY (AAR-ASR) and Delayed ETTRINGITE Formation (DEF) in new and existing concrete. Why use AQURON 7000 Corrosion Protection to extend the life of OUR concrete structure? AQURON 7000 corrosion protection penetrates deeply into concrete by molecular attraction, forming a unique hydrogel eliminating internal moisture migration, providing a proven long-term economic solution for protection from corrosion of concrete structures. AQURON 7000 concrete protection from corrosion is a more environmentally friendly option and user safe for protecting concrete structures, compared to solvent based products for protection from corrosion of concrete structures. We welcome opportunity to discuss how AQURON 7000 Corrosion Protection can make the difference for protecting your concrete structures.